Parliamentary Representative for the St. Andrew North West and Minister of Social Development, Delma Thomas engaging members of the community of Mt Horne. The recent seizure in March of several offensive weapons including knives, ice picks, cutlasses and a ray bone from 8 students attending the Grenville Secondary School, prompted law enforcement to engage the community of Mt Horne, St Andrew where the majority of the students reside. 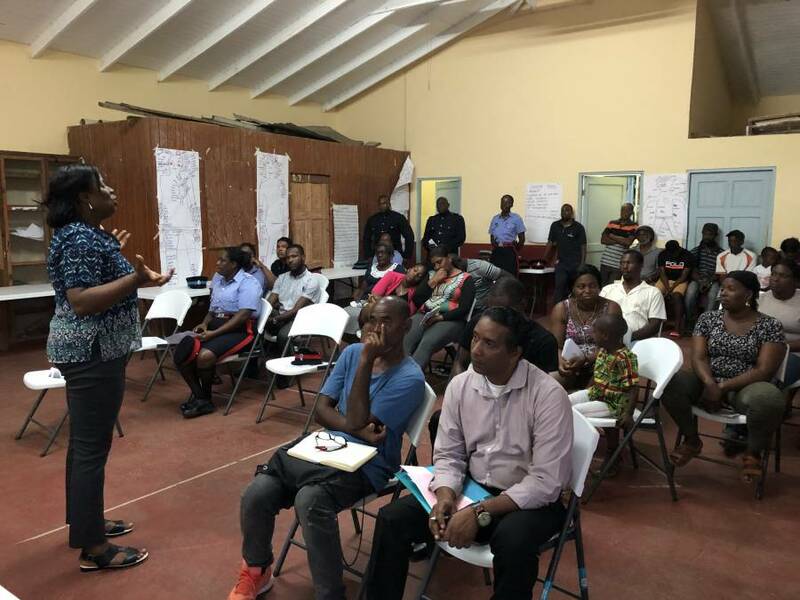 A town hall meeting with members of the community was held on Thursday evening to hear their concerns and what steps the community can take to assist the RGPF to better police the area. Several members of the rank and file of officers from the Grenville Police Station attended, including Assistant Commissioner of Police Jesmond Prince. The Parliamentary Representative for the St Andrew North West and Minister of Social Development, Delma Thomas, a resident of the community was also present. The initiative is part of the RGPF Community Policing Programme to strengthen the bond between the police and the community. The minister has called for a multidimensional approach to dealing with the issues re-emergence of the elements of criminal activity and Juvenile delinquency within the community. She has put forward plans to establish a mentorship program aimed at having professional men and women with good character to symbolically adopt a child at risk and assist in their development. Assistant Commissioner Prince encouraged parents to pay attention to their children more before they go to school as there seems to be a deficiency in the parent-child relationship. He also added that going forward, more parents will also be held accountable to the law about their children’s misbehaviour. Although the Grenville Secondary School has garnered negative publicity over the incident, Minister Thomas highlighted several positives and achievements of the school including having Deshonte Thomas a form 3 student participating in the Windward Islands Under 15 Cricket Tournament in Antigua. Shidel John also of form 3 was selected to represent Grenada in the recently held Jean Pierre Youth Under 16 Netball Championship also in Antigua. Many of the school’s achievements can be viewed on their social media page.